This comprehensive three-volume reference work collects and summarizes the wealth of information available in the field of transitional justice. Transitional justice is an emerging domain of inquiry that has gained importance with the regime changes in Latin America after the 1970s, the collapse of the European and Soviet communist regimes in 1989 and 1991, and the Arab revolutions of 2011, among others. 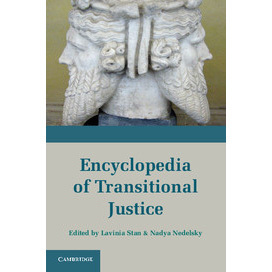 The Encyclopedia of Transitional Justice, which offers 287 entries written by 166 scholars and practitioners drawn from diverse jurisdictions, includes detailed country studies; entries on transitional justice institutions and organizations; descriptions of transitional justice methods, processes and practices; examinations of key debates and controversies; and a glossary of relevant terms and concepts. The Encyclopedia’s accessible style will appeal to a broad audience interested in understanding how different countries have reckoned with post-conflict justice. Volume 1: 1. Introduction; 2. Entries on transitional justice methods, processes, and practices; 3. Entries on transitional justice debates, controversies, and key questions; 4. Entries on transitional justice concepts and terms; Volume 2: 1. Alphabetical list of entries; 2. Thematic list of entries; 3. Entries on countries; Volume 3: 1. Alphabetical list of entries; 2. Thematic list of entries; 3. List of transitional justice institutions by country; 4. Timeline of transitional justice institutions and organizations; 5. Entries on transitional justice institutions and organizations.